At the main Coral Pink Sand Dunes entrance, there is a boardwalk and trees offering shade. Off-road vehicles are kept in the distance from those who come to walk and play in the sand. Although OHV's might be seen in the distance they are not usually heard. The non-motorized area is a play area for children and a view point for the artist and nature lover. From this area, hills of sand are viewed, nestled among the mountains. Photographers sit and wait for the sun to rise over the majestic dunes, that seem to set the sand on fire. The Coral Pink Sand Dunes is a favorite spot for astronomy. Throughout the summer look for posted times for astronomy workshops. Movie History: Coral Pink Sand Dunes - More than just a sand box for play, the Coral Pink Sand Dunes is famous for its use in the movie, "The Greatest Story Ever Told." The dunes was chosen because of its resemblance to the vast sands of Egypt. The cast was filled with heavyweights of the movie industry: Max Von Sydow, John Wayne, Charlton Heston, Sidney Poitier and Shelley Winters. They played main roles in this grand portrayal of the life of Jesus. The movie was released February 15, 1965. Diana's Throne Diana's Throne is a fun hike over slickrock that is located across from the turn-off to the Coral Pink Sand Dunes (3 miles from Mt. Carmel Junction). The road to the throne is a 4WD road, but it can be walked. There is no trail on the throne, but hikers scramble up the slickrock where the view of Zion National Park, in the distance, is outstanding. Rumor says that Diana threw herself off the throne because the beauty was too much to bear. The red on the rock is said to be her blood. There is a fun wash to explore behind Diana's Throne that ends at the entrance to the Barracks. A Four Season Park - Winter is the time to bring sleds and slide down the rolling hills of snow covered sand. Photographers revel in the picturesque scenes of winter. Spring brings warmth and the urge to roll, crawl, dig-in, throw sand and build sand castles. Summer is when tourists flock to the boardwalk and gaze at the dunes and cliffs beyond. Youngsters dig deep, finding the cool sand and cover themselves from the neck down. In the Autumn, the crowds leave once again leaving a peaceful, relaxing place to unwind. 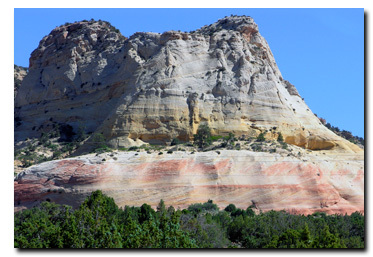 From Hurricane, Utah take Utah 59 to Arizona 389 just past Colorado City look for the road leading to the Coral Pink Sand Dunes. It will come out 3 miles from Mt. Carmel Junction, Utah. Do not travel through the dunes when it's been raining or the roads are wet from snow. From Hurricane, Utah take Utah 59 to Arizona 389 and travel to Fredonia, Arizona, then to Kanab, Utah. Drive on US Highway toward Mt. Carmel Junction, turning at the signed entranced to the Coral Pink Sand Dunes.